The grand staff (or “great stave” as it’s called in Britain), is a combination of two staves put together, usually a treble clef and a bass clef. This combination clef is used for a variety of instruments, including piano, organ, marimba (pictured above), harp, and more. Both staves are played by one person at the same time, so it’s important to be comfortable reading both clefs. So what’s the point of using a grand staff? Wouldn’t it be simpler to just use a single clef, like usual? The answer is pretty simple. Let’s use the piano as an example. Since the piano has such a huge range, one clef alone would not be enough. 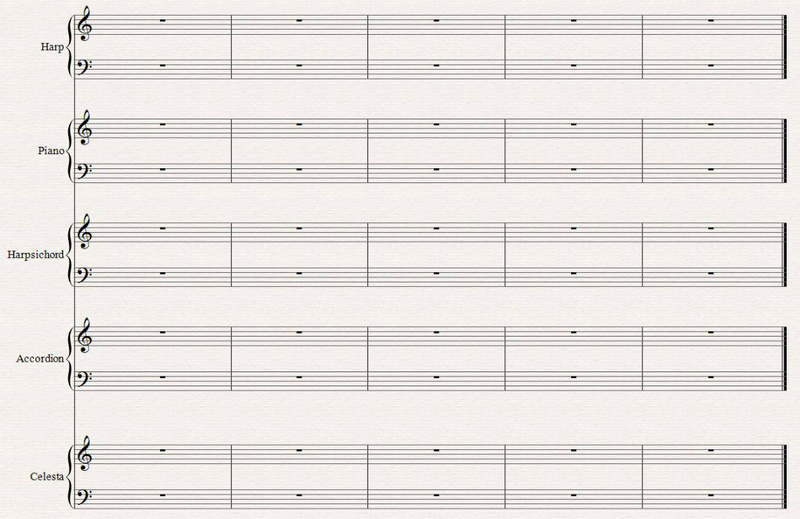 For example, if we chose to use the treble clef, we would need 11 ledger lines whenever we wanted to play the note C1! Switching back and forth between clefs is also not going to work, because the piano is played with both hands. Often, the left hand needs to play down low while the right hand plays up high. The solution is to use a grand staff, which consists of two staves, one on top of the other. Most of the time, the top staff is a treble clef and the bottom is a bass clef. This lets us play as low as we want in the left hand and as high as we want in the right hand, at the same time. It’s the same concept for other instruments with a wide range (mostly keyboard instruments and tuned percussion). The grand staff provides full access to the entire range of these wide-ranged instruments. The grand staff is very common in almost every musical situation, from classical music to jazz, rock, pop, in the studio, etc. Some of the many instruments that use it include: piano, church organ, Hammond organ, electronic keyboards, celeste, harp, accordion, and marimba. In order to read successfully from a grand staff, it’s important to be comfortable reading both treble and bass clefs individually. The challenge of the grand staff is to learn to read from both staves at once. As with anything, practice is the key. Things that start out difficult will eventually become second nature. One area that needs specific attention is the overlap, where it can get a bit tricky. You see, the two staves don’t literally connect with each other. Each one still acts like it’s by itself. 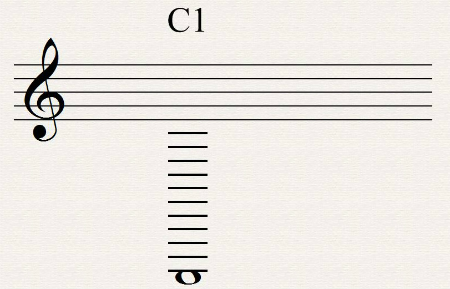 So, for example, the note C4 (middle C) can be written either on the upper (treble) staff, or on the lower (bass) staff. It’s not placed directly in the center, between the two staves. The upper staff is meant for notes played by the right hand, and the lower staff is for the left hand. Depending on the context (what’s going on in each hand at the time), you would first decide which hand to use to play the notes, and then write them on the staff associated with that hand (upper for right hand, lower for left). For example, the note E4 can be written on either staff. First we need to decide which hand is going to play it. If we want it played by the right hand, we would write it in the upper staff; if we want it to be played by the left hand (for example, because the right hand is busy playing something else higher up), then we would put it in the bottom staff. This normally happens when both hands are playing in the same register (pitch area of the instrument). For example, if the left hand is playing higher than usual, it’s typical to use a treble clef even in the bottom staff. Similarly, if the right hand is playing lower than usual, both staves might use bass clefs. Even though both hands are using the same clef, it still makes sense to leave them as separate staves so that the player knows which hand to use to play which notes. Also, trying to fit all the music from both hands onto one staff like sardines would make the music very difficult to read! In organ music, whether it’s church organ or the more rock-oriented Hammond organ, we often find a grand staff that consists of 3 staves. In this case, the top staff is for the right hand, the middle staff is for the left hand, and the bottom staff is for the pedals, which are operated by the player’s feet. The poor organ player has to do all those things at once, while still managing to keep his gum inside his mouth. The bottom staff for the organ pedals uses a bass clef. Just like the regular grand staff, all three staves are connected on the left side by a bar line. However, only the top two staves are connected by a brace. The bar lines, also, connect just the top two staves, but not the bottom staff. The point of this design is to remind us that the top two staves are for the hands, which are working together, as opposed to the pedals which are operated by the feet. How many staves are part of a typical grand staff? Which of the following instruments normally use a grand staff? What is the name of the musical symbol that links the staves of a grand staff on the left side? Are the bar lines of a grand staff normally joined together vertically? Music written on the lower staff of a grand staff should be played by which hand? Does a grand staff have to consist of one treble clef and one bass clef? What’s the purpose of the third (bottom) staff on a grand staff for organ music? Which clef do the organ pedals use?